We manufacture a range of products to create beautiful wardrobes, sliding wardrobe doors and matching freestanding furniture. 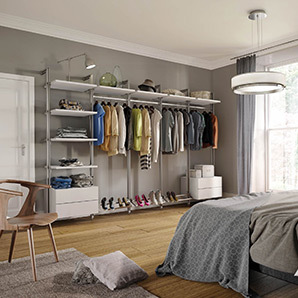 From shelves to hanger bars, shoe racks to drawer boxes, we have a complete range of accessories to make the ‘perfect’ clothes storage solution. We have a range of modular ‘stanchion’ based systems in addition to wooden solutions, which are then ‘finished’ using one of our sliding doors. We manufacture doors in a huge range of colours and materials, with endless custom options to create a truly personalised wardrobe. Typically used to front wardrobes, our sliding doors can be used in numerous locations including utility rooms and attic space. 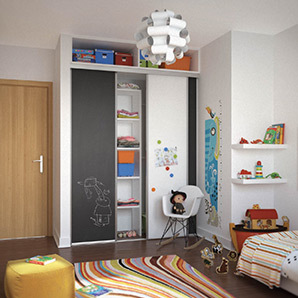 Our double sided doors can also be used to create super premium walk-in wardrobes or used as room dividers, giving a functional break to your space. Our storage systems can be used in both home living and home office environments, with accessories such as media units and matrix shelving creating a completely personalised living space.